Revengeofthe5th.net: Greedo was originally named...ALLEN? You likely heard about a librarian in England finding a draft script of Star Wars in a library, revealing that Han Solo was always the first one to shoot in the Mos Eisley Cantina. 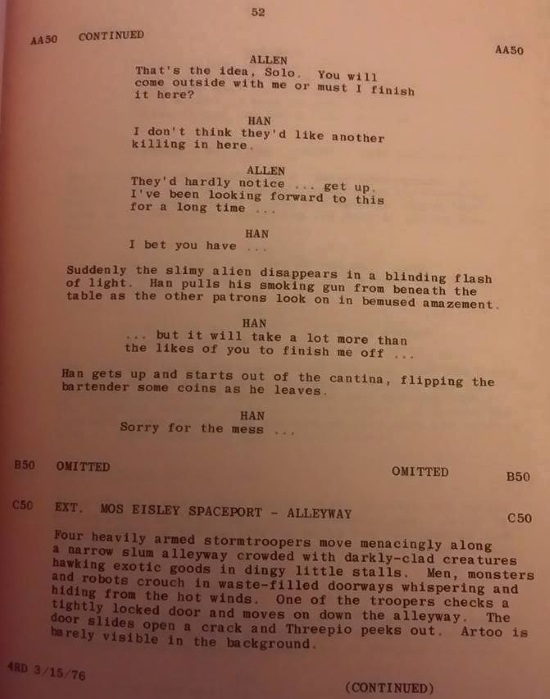 Peter Mayhew posted a scan from the script on his Facebook page, which revealed a strange tidbit: Greedo was originally named ALLEN! For all we know, Allen is his real name, and Greedo is his last name, or vice versa. Either way, the important thing is Han shot first.